(Nanowerk News) Leica Microsystems continues to extend the capabilities of confocal super-resolution with its new STED platform Leica TCS SP8 STED 3X. The first presentation to the public will be at the annual meetings of the Society for Neuroscience in San Diego, USA, and of the American Society for Cell Biology in New Orleans, USA, during November and December 2013 respectively. 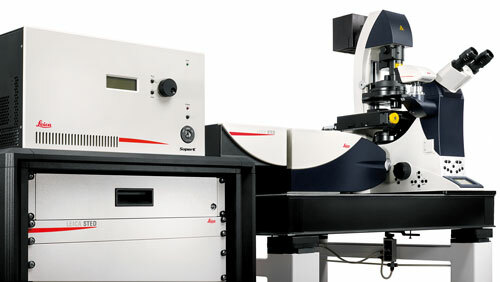 Leica TCS SP8 STED 3X super-resolution system. Revealing the full spectrum of life in 3D - fast and directly. The 3D STED system Leica TCS SP8 STED 3X achieves resolutions below the diffraction limit in lateral as well as axial directions. It offers the freedom to optizme resolution in all dimension and to choose the setting that optimally fits the scientific question. The system is freely adjustable for best lateral resolution, best vertical resolution and smallest confocal volume. Additionally, Leica TCS SP8 STED 3X offers multiple depletion laser choices that open up the spectrum of visible light for confocal super-resolution and gives improved capabilities for research imaging. The investigation of subcellular architecture and cell dynamics in living cells is an exciting challenge in life science research. STED (STimulated Emission Depletion) is the only purely optical microscopy technology that yields resolution of structures below 50 nm without data processing. The extension of STED technology to the third dimension and the freedom to use even more fluorophores raises super-resolution to a new level. Leica Microsystems’ new STED super-resolution system is based on the Leica TCS SP8 confocal platform. Due to its modular concept, upgrading a Leica TCS SP8 to Leica TCS SP8 STED 3X is possible at any time. Its historically close cooperation with the scientific community is the key to Leica Microsystems’ tradition of innovation, which draws on users’ ideas and creates solutions tailored to their requirements. At the global level, Leica Microsystems is organized in three divisions, all of which are among the leaders in their respective fields: the Life Science Division, Industry Division and Medical Division. The company is represented in over 100 countries with 6 manufacturing facilities in 5 countries, sales and service organizations in 20 countries, and an international network of dealers. The company is headquartered in Wetzlar, Germany.